market with prices that far undercut yours affect you? It’s one of retailers’ most frequent nightmares. The practice of undercutting prices is known as penetration pricing, and it’s designed to enable that competitor to gain market share in a crowded market, or even drive out its established retailers – including you – completely. 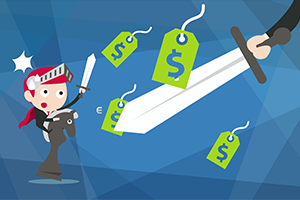 Often, this penetration pricing strategy leads to a price war that keeps escalating until the downward spiral of price-cutting decimates a number of businesses involved in it. So, how can you avoid becoming a casualty in this war? Shift the battleground to a different one of your choosing. Price isn’t everything. Many customers are glad to pay a higher price for higher quality. Position yourself as the quality leader. You can do this in a straightforward way, pointing out the benefits that your superior quality brings. Or you can do this in an even more powerful way, by turning the situation around. Psychological tests have shown that consumers are more motivated to avoid a loss of something good than they are to seek out the gain of something good. Remind them what benefits they’ll lose by going with inferior quality. Another area where you can complete is on customer experience. Are you quickly and effectively fixing negative customer experiences? That’s a start. Are you proactively working to keep negative customer experiences from happening? That’s better. Are you offering customers an experience that is noticeably superior to what they receive from your competitors? That’s when you can truly compete on customer experience. Again, if you offer this type of experience, remind those customers who are on the fence about going with a lower-priced competitor of what they’ll lose if they do. You can compete on price. But you have to be smart about it. And you have to know where your competitor is vulnerable. Know your competitor’s pricing structure so you can make informed decisions on where they are most exposed. Knowing the strengths and weaknesses of your pricing and that of your competitors is essential to determining a winning pricing strategy. This is exactly the kind of competitive intelligence you can obtain with a price monitoring tool like PriceManager, not just when penetration pricing strikes, but on an ongoing basis to keep a step ahead of your competitors – whatever their pricing strategy may be.